Here is a look at the finished card. I love this color combination of the light to medium pink and a coral pink. To start I die cut a piece of Hammermill Color Copy Dogital Cover paper using the largest die in the DIE-05033 JustRite Three In A Row set. Then I used Tuxedo Black ink to stamp the floral images from the CR-05028 Chrysanthemums Clear Stamps. 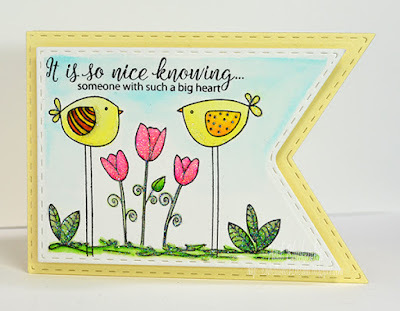 In the video (I will leave a link below) Jennifer uses the MISTI tool for her stamping. 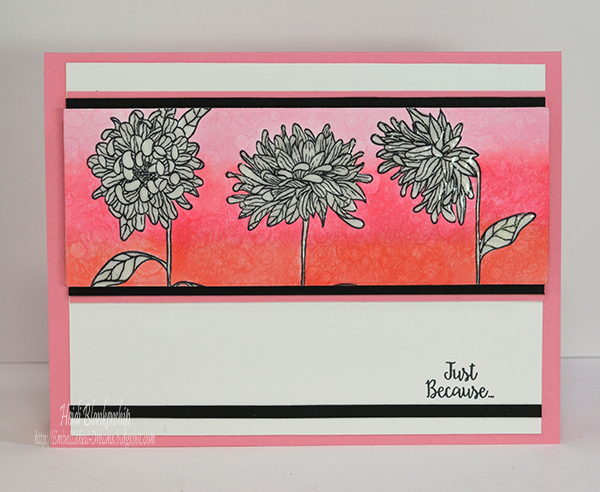 I have the MISTI tool but I was only stamping one time for each flower and using Memento Tuxedo Black ink. I started coloring the negative space (background) with the lightest Copic marker RV00 and I colored the entire piece. Then I came in with the medium Copic color RV13 and colored the middle and then I blended it back out using the RV00 marker. For the last and darkest color I used R22 on the bottom and then I blended the colored back out with RV13 and RV00. Like I said I love the look of watercolor and I just can't help myself lol. So I used some of the 0-Colorless Blender to try and achieve the look of a watercolor with the water droplets. First I put some of the colorless blender on my craft mat and then I used and old makeup brush to dab on some of the colorless blender. Then I also added some to the paint brush to create larger droplets. I just love how this piece turned out! 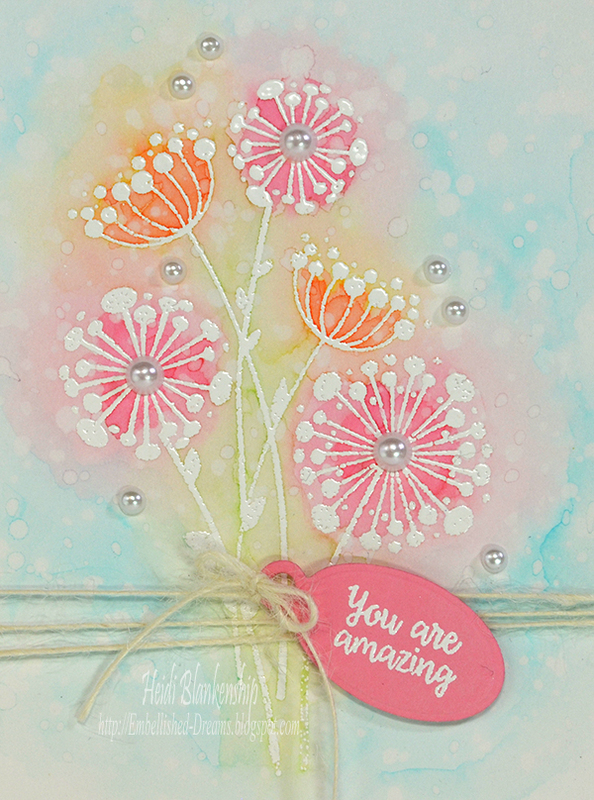 Next I wanted to add a touch of sparkle so I added the Zig Wink of Stella Clear Glitter Brush Pen to the flowers. To finish off the flowers I added Ranger Glossy Accents. 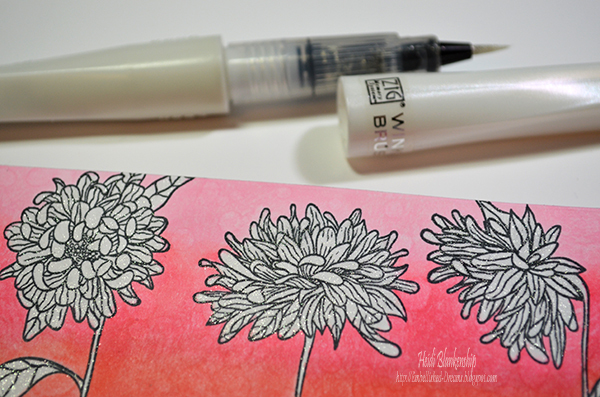 To finish off the card I added the watercolor piece to a black and pink cardstock mat. Then I added those pieces to the white card front. I stamped the sentiment in the bottom corner and added a thin strip of black paper. Then I mounted everything to a pink card base. To see Jennifer McGuire's video on Negative Space Coloring you can click HERE and you can click HERE to visit her blog. This is a really quick, easy, and fun technique and I hope you will give it a try! For this card I started with a piece of Strathmore Mixed Media paper. 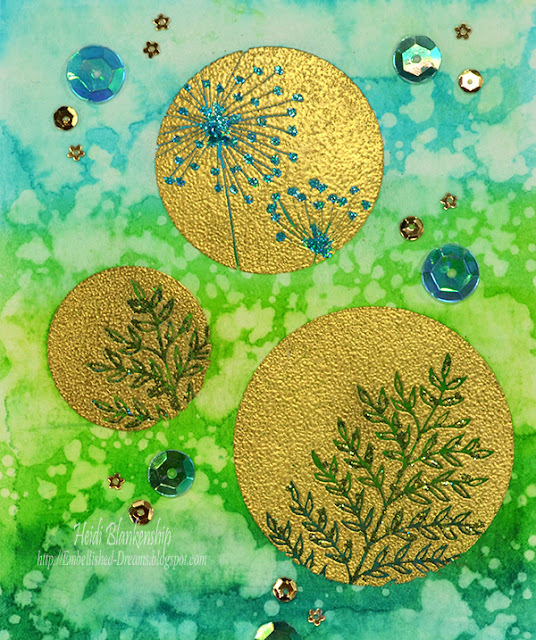 Then I used some of the stamps from the CR-05032 Meadow Circles Clear Stamps along with VersaMark ink and Tonic Studios - NUVO Glod Embossing Powder and a heat tool to heat set the images. Then I used several colors of the Zig Clean Color Real Brush Pens - Light Blue, Cobalt Blue, Pale Green, May Green, Light Green, Persian Green, Turquoise Green pens, I started by going from the lightest blue, then in to the green and then finished with the blue greens. Once the watercolor was dry I used a paint brush with clean water to add water droplets. I let the water droplets sit for a few seconds and then blotted with a paper towel. I used the heat to to dry the paper and repeated the water droplets a few times until I was happy with the look of the background. After the watercolor piece was all dry then I used the NUVO Medium Glue Pen to add adhesive on the flower and leaves inside the circle images. For the flower I used NUVO Sheer Glitter Turquoise and for the leaves I used NUVO Sheer Glitter Olive Green. Once the glue had a few minutes to set and dry I removed the excess glitter. For some embellishments I added some Cartwright Sequins - 8 mm, 10 mm, Bahama Blue SC Iris, 3 mm Gold Flowers, 4 mm Gold. I used Ranger - Multi Medium Matte to adhere the sequins. 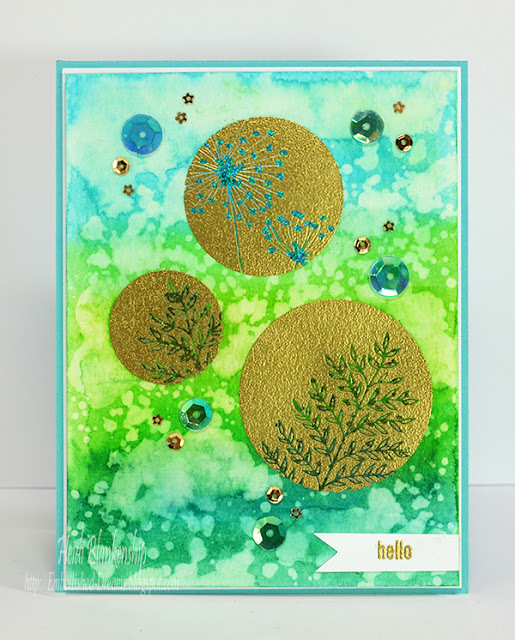 To finish off the card I used VersaMark ink to stamp the hello sentiment from the CR-05032 Meadow Circles Clear Stamps and then I used the same gold embossing powder and heat set the sentiment. Then I cut a flag tail on one end of the paper and adhered it to the from of the watercolor piece. I used white craft foam and scor-tape to adhere the watercolor base to a white cardstock mat and then to the aqua card base. 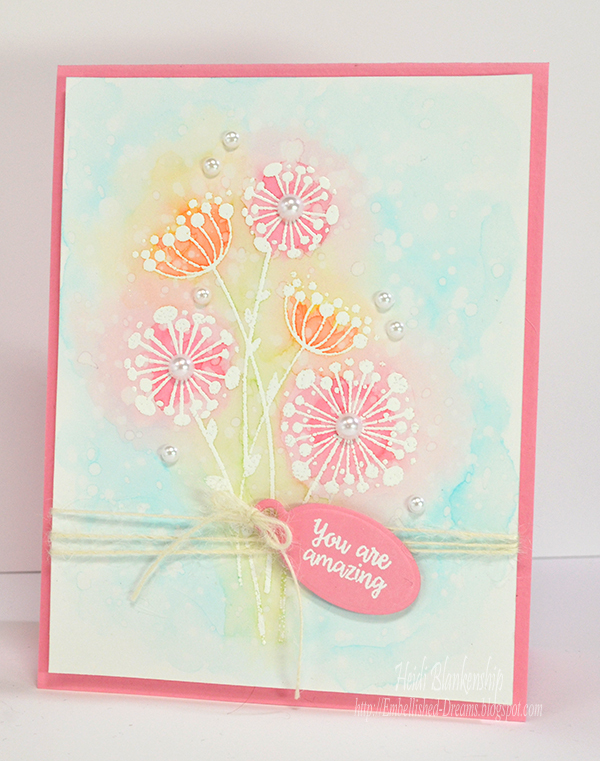 I just love the look of watercolor with the water droplets! 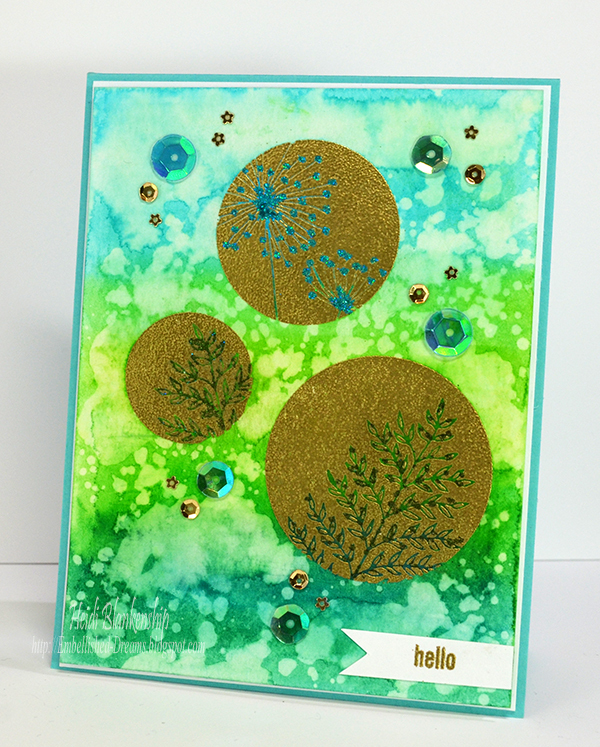 Thanks so much for stopping by today for another card share and I will have another project coming real soon! Hello Blogging Friends! I have a quick and cute card share for today. For today's card I used the largest banner die in the DIE-05020 JustRite Stitched A2 Banners and Rectangles die set to create the base for a fun little shape card. Check out these doodled birds--they are so cute! This is one of those fun stamp sets that just makes you smile. I used light yellow cardstock for the base of the card. I used the smaller banner die in the DIE-05020 JustRite Stitched A2 Banners and Rectangles set to cut a piece of Strathmore Mixed Media paper and then I stamped the images from the CR-05030 Doodled Birds Clear Stamps using Ranger - Jet Black Archival Ink. I used Zig Clean Color Real Brush Pens - Light Pink, Pink, Pale Green, Light Green, Yellow, Lemon Yellow, Bright Yellow, Orange, and Light Blue to color the images and background. I wanted to add a little sparkle to the card so I used Ranger - Glossy Accents and Stampendous - Multi Ultra Fine Crystal Glitter. I used scor-tape and white craft foam to adhere the watercolor piece to the card front. I hope you enjoyed today's card and for more inspiration don't forget to check out the JustRite Blog and the JustRite Facebook page. Thanks so much for stopping by and Happy Sunday! Hello everyone! I hope you are all having a wonderful weekend. Thank you all so very much for all of your sweet comments, thoughts and prayers for my husband and myself. He is doing great and back to work. :) I have been starting to feel a little better too and I can tell the meds are starting to work. I am still having pain but it is no where near as bad as it was. But I have to be careful and not over do it--if I do too much then my arm starts to really hurt. So I do a little and then take a break and then come back to it in a bit. But I am very thankful my husband is doing great and I am getting better too. We truly appreciate all of your thoughts and prayers!! Today, I have a pretty watercolor card to share with you using some of the new stamp releases from JustRite Papercraft. 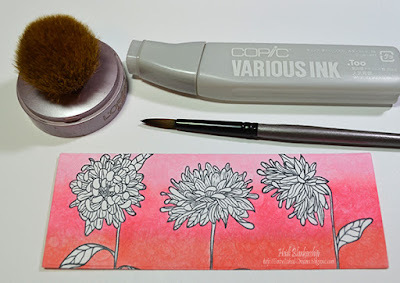 I love this new stamp set--the flowers are so fun and kind of remind me of a combination of whimsical dandelions and elegant Queen Ann's Lace. 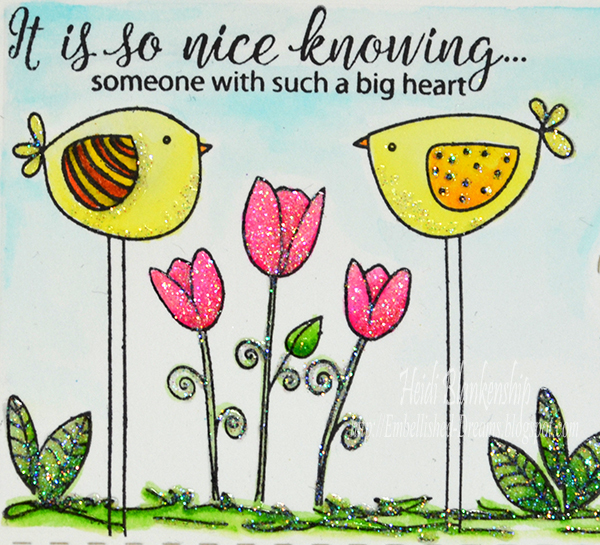 I think these image could be used for fun and playful cards--like this watercolor card or if they were embossed in a metallic color they could be very elegant. I used the CR-05029 Floral Silhouettes One Clear Stamps with VersaMark ink for the background and heat embossed using Tonic Studios - NUVO White Embossing Powder. Then I used the Zig Clean Color Real Brush Pens - Light Carmine, Orange, Pale green, Light Green, Light Blue, and Cobalt Blue to watercolor the flowers and the background. For the paper I used Strathmore Mixed Media, this is my favorite paper to use when I am stamping and doing watercolor. The paper is ultra smooth so you get a nice crisp stamped image every time, since it is for mixed media it can handle the water and the paper is 140 lbs so it is a nice heavy paper. After the watercolor was dry I used a paintbrush with clean water to add the water drops and then blotted them off with a paper towel. 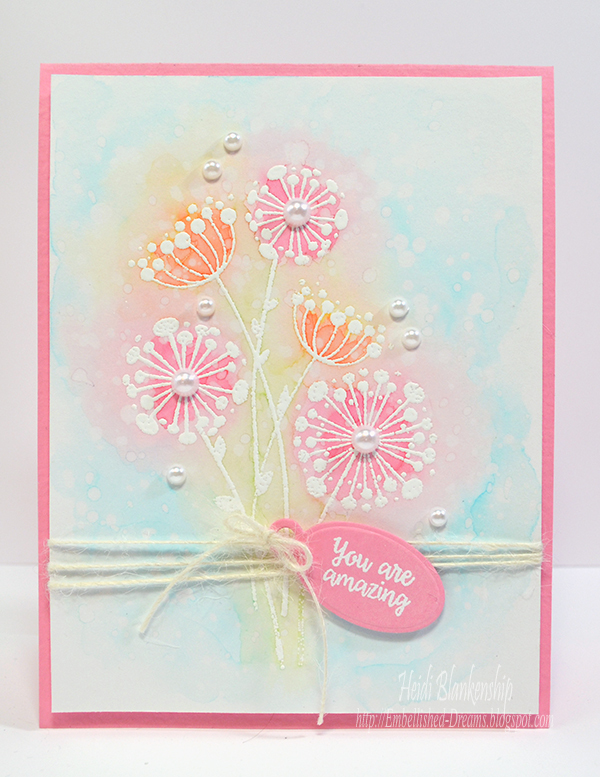 I added a few white flat back pearls to the center or some of the flowers and then scattered a few more on the card. I used Ranger - Multi Medium Matte to adhere the pearls, it is a really good and strong liquid adhesive. 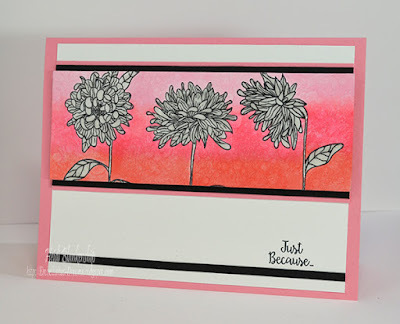 For the sentiment I used one of the stamps from the CR-05028 Chrysanthemums Clear Stamps set and stamped in on to pink cardstock. I stamped it with VersaMark ink and then used more of the Tonic Studios - NUVO White Embossing Powder to heat set the sentiment. Then I used one of the dies from the DIE-05001 JustRite Snowflake and Tag Dies. To adhere the tag die cut I added some white twine, wrapped it around the card base a couple of times and tied a bow. I used Scor-Tape and white craft form to adhere the watercolor piece to the pink cardstock base. Thanks so much for joining me today and I hope you liked the card share! To see more cards and inspirations from the Design Team don't forget to check out the JustRite Blog and the JustRite Facebook Page. Hello blogging friends! I am so excited to share my very first ICE Resin® Design Team project with you! Our theme for the project was power words but it was open to our own interpretation. My power word is Believe. I think Believe is a great power word because it can have different meanings for everyone. For my project I used an open back bookplate to create a bezel. I filled it with ICE Resin®, Iced Enamels™ Inclusions Shattered Mica in Chartreuse and Silver, my power word Believe charm and a butterfly charm. I added crystals and rhinestone chain to embellish the bookplate bezel and then I added a beaded dangle and chain to finish off this beautiful necklace. 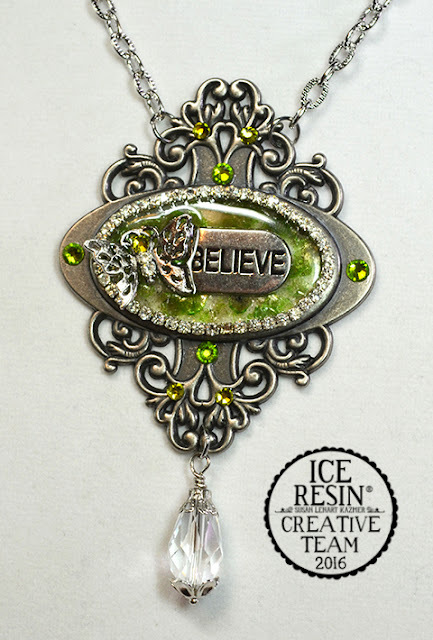 You can click HERE to visit the ICE Resin® Blog and find out all of the details and see a step-by-step picture tutorial on how to create this bookplate open back bezel. Hello everyone! I know it has been awhile since my last blog post. Sorry I have been MIA for the past few weeks! My husband is a pretty private person and I respect that so I am not going to go in to all of the details but he had to have surgery a few weeks ago. The surgery was successful and we received very good news from the doctor so we are very happy and thankful. A lot of you who have been following my blog for awhile know that I have RA. I don't talk much about it or try to dwell on it I just try to manage the pain. About a week before my husband's surgery I started having a lot of pain on my right side--neck, back, shoulder, arm, and down to my fingertips. At first I thought I was having a bad flare up from the RA but it just kept getting worse and the pain was unbearable. Then I started to have numbness and tingling in my hand and fingers so I knew something was going on and it was more than just the RA. After my husband came home from the hospital (we were out of town) then I was able to get in to see my regular doctor. I've had RA for about 8 years now and I remember when I was first diagnosed the doctor told me that 1--there was no known cure, just pain management and 2--a lot of people who have RA can end up also having fibromyalgia, lupus, or other types of auto immune diseases. So I wasn't completely shocked when the doctor told me that in addition to the RA I also have fibromyalgia. But it also wasn't the news I was hoping for--I was hoping I maybe just had a pinched nerve or something like that. My doctor said the pain was so severe because the RA and the fibro were both flaring up at the same time. She said to think of it like a tooth ache with an exposed nerve but she said this would be more like a 1000 tooth aches with exposed nerves all at once. So needless to say I have been very medicated for the past couple of weeks trying to get the nerves to clam down and not have such severe pain. I can tell the medicine is starting to work but I still have a lot of pain and the medication makes me kind of loopy and very sleepy so I have kind of stayed away from my blog and anything with social media--I don't want to end up posting something that sounds totally crazy--plus the meds make it kind of hard to concentrate. I haven't done hardly any creative work the past couple of weeks but I do have a few projects that are done and I will post them when I can. I am excited to share my first ICE Resin® DT project with all of you and that will be another post going up today. So I just wanted to give you a little life update and let you know why I haven't been around. I am hopeful that over the next few days things will keep getting better and I can get back to doing what I love. my first ICE Resin DT project! ICE Resin Creative Team 2016! Hello everyone! This week and over the next couple of weeks all of the ICE Resin® Creative Team Members are being introduced over on the ICE Resin Blog. My introduction and about me post is up today over on the ICE Resin Blog. I would love it if you would hop on over there and check it out! I have several pieces of my jewelry and design work using ICE Resin® and a little bit about myself as well. 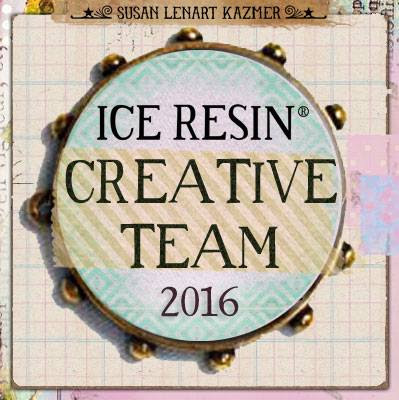 Be sure to check out the ICE Resin® Blog over the next couple of weeks to meet all the talented people on the 2016 Creative Team! I'm sorry for the lack of projects over the past few weeks. My RA has really been flaring up so it had put a damper on being able to create. Hopefully it will pass soon and I can get back to doing what I love!